Hello and welcome everyone to the Nokia N8 Review Week here on Fone Arena! Each day of this week, one of our team members will cover one area of Nokia’s imaging flagship with all the do’s and dont’s. This should make for an exciting week and we’re all looking forward to that! Today is Sunday, my name is Rita El Khoury and I’m going to tell you about the Nokia N8 connectivity and what you can expect of it. Enjoy reading along and if you have any questions on that matter, leave a comment! Let’s get this straight out of the way first. Connectivity on the Nokia N8, and Symbian^3 in general, is a disaster most of the time. I’ve spoken to numerous persons about it, old Symbian users, new Symbian users, and we all seem to agree that it’s a whirlwind of chaos and unexpected behavior that you have no control over at all. 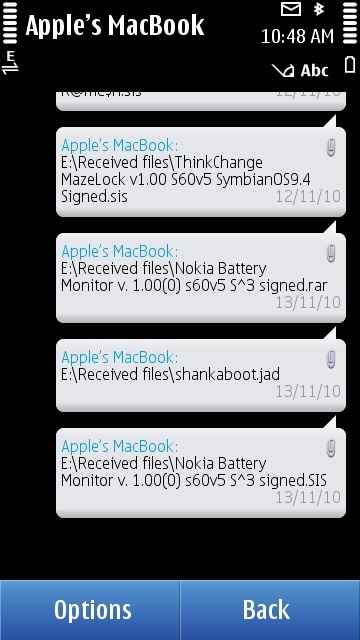 Previously, one of the major benefits of Symbian was that you could control everything related to Connectivity on it. Every time a connection to the internet, via WiFi or 3G or Edge, was required, you had the option to accept or deny access and that was the end of it. Symbian was extremely friendly for users with limited data packages, and that made it the default platform for everyone in that situation. In comparison, Android and iOS for example, just assume you have an unlimited data plan and use whatever is available to them, no questions asked. In a move to mimic this simplicity, Symbian adopted this scheme, and while many thought it is the good way to go, the end result is a total disaster. Many third party applications on Symbian^3 still have their own Access Point choices, Java and widgets handle connectivity in a poor way, turning off WiFi and/or data (3G and Edge) usage is a mathematical riddle of settings, and the final picture is that you neither have full control like with previous Symbian iterations, nor given total access like on Android and iOS, but a midway solution that satisfies no one and leaves you cringing in your seat every time you look and see the 3G AND WiFi signals on at the same time, or when you try to do something basic and keep getting asked whether you want to allow the connection. 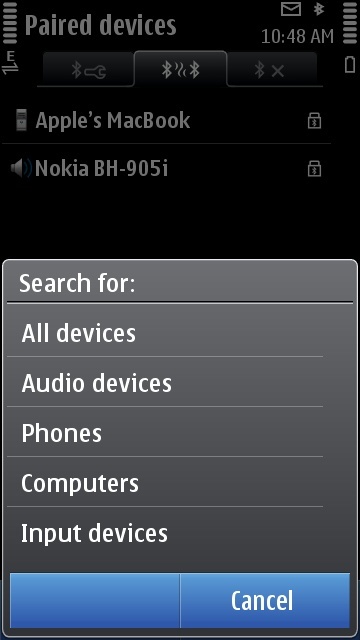 Bluetooth is probably one of the aspects where Symbian^3 has improved over previous versions. Setting up a bluetooth connection with another device remains as simple as it was before, pairing up two devices as well as authorizing/deauthorizing a device to make connections automatically are still there. There are two major differences though in the bluetooth connectivity scheme. The first one is that when you’re searching for a device to pair with, you can now specify what type of device to look for: All Devices, Audio Devices, Phones, Computers and Input Devices are the available options. The second one is that messages received do appear in the Messaging Inbox (and show up on the Notifications widget on the Homescreen) but they are not saved on the C:/ internal memory, instead they are saved in the mass storage under E:/Received Files. This last change, only previously introduced with the Nokia X6, means that you no longer need third-party file browsers like X-Plore to transfer received bluetooth files to a folder of your choice, but they are now readily accessible within the default browser. Buried deep within Settings / Connectivity / Settings, you will find the connectivity settings for the N8. There are 4 different selections. 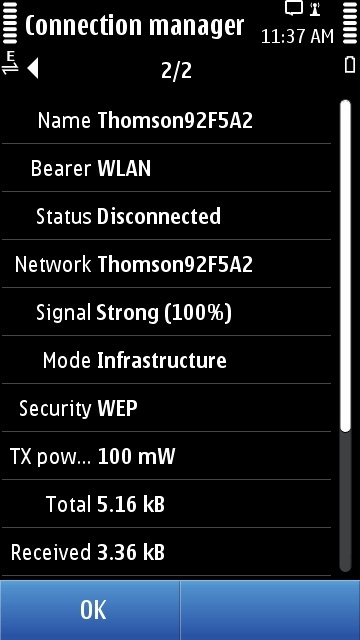 Switch to WLAN: can be set to Manual or Known WLANs only, so you either have to go search for WiFI networks and click to join them or the N8 will automatically connect to the networks you’ve already identified and joined before. There is no Always Ask option, so you either choose to give it full freedom or make a decision to consciously be aware of everytime you want to switch to WiFi and do it. The major drawback of setting it to automatically connect to known WLANs is that free WiFi networks that require passing by a landing page to approve, will connect but nothing will work, unless you remember the landing page and go to it manually from the web browser. Data use in home network: can be set to Automatic, Always Ask or WLAN only. WLAN only is your only option to deactivate 3G and Edge use on your device. Always ask will take you back to the old Symbian ways, and Automatic is what everyone was asking for since the dawn of unlimited data plans. Data use when roaming: these are the same settings as above, except they are only applied when you leave the country and your SIM card recognizes another network and starts roaming on it. Use WLAN only here to avoid monstrous data charges. Destinations: let you prioritize your Access Points, so you can set which one to prefer if two are available simultaneously. These can also be used to prioritize WiFi networks over Data ones, or the opposite, though I have yet to find how all of it works with the 3 settings above. If you want to switch 3G use on/off, you will need to step out of this to Settings / Connectivity / Network and toggle the Network Mode between Dual Mode, 3G and GSM. The Connection Manager lets you view your currently active connections, their details (bandwidth usage and more) and disconnect any of them. However they will pop back up if a certain app/process is requesting them. First of all, the lack of easy on/off toggles. Many many users won’t find these settings, many will see them and not understand what they really mean. Yes, there’s a lot of control over how things work, and it’s one of Symbian^3’s strengths, but there’s no easy presentation of that control, so instead of being an advantage, it turns out into a major drawback. The ideal solution would have been to have a WiFi on/off, and Data off/3G/Edge/Dual toggles somewhere as widgets on the homescreen, instead of delving 3 levels deep everytime you want to make a simple switch. Second, the redundancy/incompatibility of the Destinations and other settings. Say for example you switch WiFi usage to Manual, what good is having the WiFi network as a top priority in Destinations? The third glaring issue is the lack of integration with some Java and third party apps. Gravity for example, still carries its own settings, disregarding the Destinations. 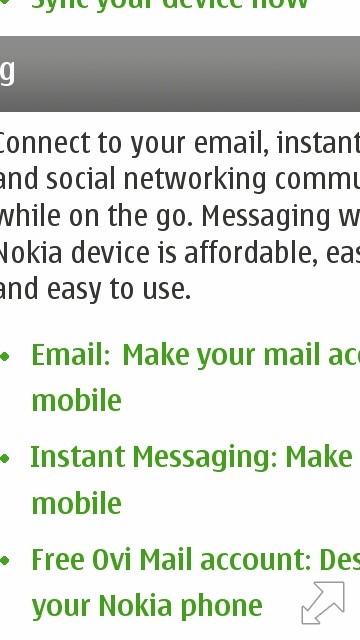 Nokia Messaging works on a whim most of the time, and you really have no idea when it’s connected and when it isn’t. WhatsApp will use your data regardless of the presence or not of a WiFi network, it can connect to a WiFi only in offline mode, or if you specifically go and turn Data Use in Home Network to WiFi only. So there is no way to accommodate an easy data/wifi switch when available. Some widgets and some java apps will keep asking you to authorize them to connect, despite you having set everything up as automatic and authorized. The forth, and one of the most important problems, is that you can’t tell what app/process is using what connection. So most of the time, you will find yourself with a connection to the network, of some sort, that you can’t trace back to anything, and can’t stop unless you turn off all connectivity options. 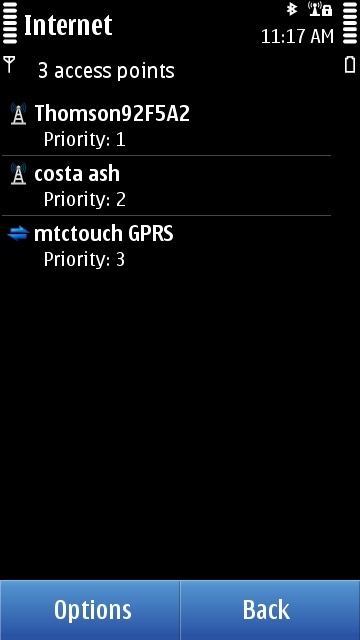 One of my main problems lately is that my MMS access point keeps getting activated for no reason whatsoever. There is no app that uses it, there’s no MMS being sent or in the Outbox, and most terrifyingly, that MMS Access Point is NOT even in my destinations. Really? 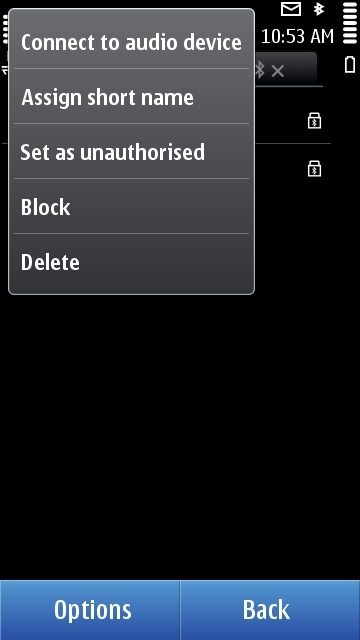 So I haven’t authorized this access point, nothing uses it, and it keeps popping up and using small chunks of data? I try to disconnect it yet it pops back up. I don’t get it. 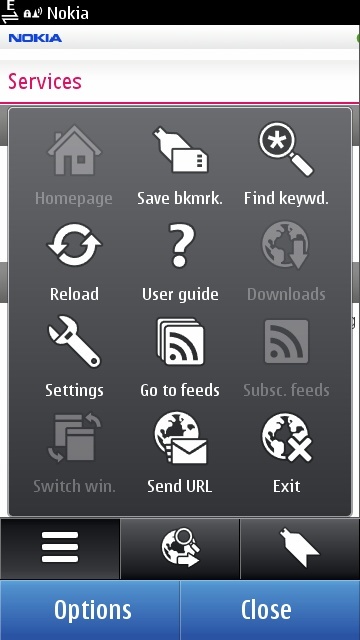 The browser on the Nokia N8 and Symbian^3 does a great job at displaying one web page, except it stops at that. It will take a bit of time to turn up big web pages, but it will do it, and it supports flash right out of the box which is its major advantage. The new features it brings are multitouch support for zooming in/out of a page (but it doesn’t redraw the text columns to fit the zooming levels) and the new Search box that pops up when you want to type a new address. However, as I said, the rosy experience stops at that. There’s no multiple tab support, no opening a link in a new tab, no way to specify where you want a certain file to be downloaded and saved to, no way to select text or save images, no easy way to copy a page’s address unless you forward it as an SMS and copy the link there, also the option to save a page for offline viewing is gone… And one of its main drawbacks is that it won’t cache the previous 3-4 pages, so if you click back, it will reload the page *sigh*. Nokia themselves have admitted to the archaic feel of this browser in regards to recent browsers on other platforms, and they confirmed working on a totally new and redesigned browser, so we won’t dwell over the current one. In the meantime, I have switched to Opera Mini and Opera Mobile and they do a fantastic job handling everything I throw at them (I’m not big on flash viewing in web browsers). The Connectivity experience on Symbian^3 is half baked and the improvements that were added to previous Symbian iterations make it lose its identity. It’s no longer a full-control connectivity platform like it used to be, and it isn’t a relaxed use-any-network-you-need experience either. The end result is that data-conscious people won’t feel at ease with it, and unlimited data users will be pretty pissed with all the questions and nagging. There is a lot of control under the hood, if you know where to look for it and how to set it up, except most of the time it’s not exactly where it’s needed (Connection Manager) and this excess makes things much harder instead of easier (Connectivity Settings), and you’d be hard pressed to find your ideal setup no matter how hard you try. Many problems still plague the connectivity settings and usages, not the least of which is the lack of easy toggles and the way third party applications still function as separate entities. The browser is promised a major overhaul next year, and until then, it’s functional if you’re only looking for a quick few-pages browse, and not expecting to carry the text, images, or links to another application. 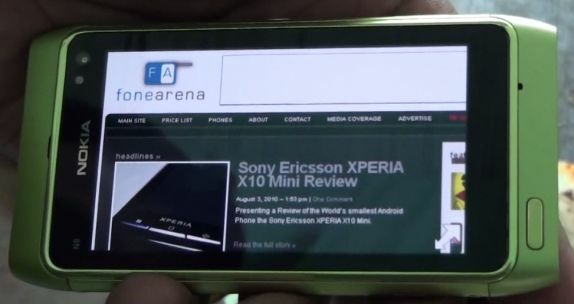 Next Next post: Sony Ericsson Xperia X7 and X7 Mini leaked !